Let your Jeep do the heavy hauling. We have taken our Congo Classic 2 Door and 4 Door and given it a facelift. This KMS Roof Pak is 42" x 52" perforated aluminum cargo basket. Jeep racks were built for people who live for the weekends. Easily carry work gear and outdoor gear on a roof rack, turning every day into a now-possible backroads adventure. Throw your spare tire on your rack, or strap in the extra camping gear that you don’t want muddying the seats. 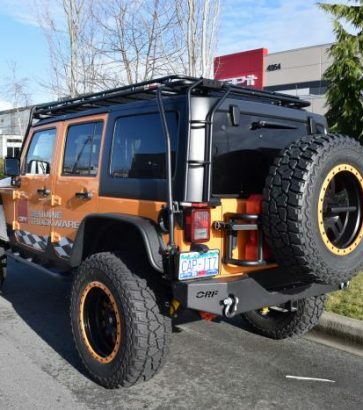 These Jeep products offer stylish built-in attachment points for lights, shovels, and definitely that spare tire. They’re perfect for thrill seekers who like to play it safe by bringing extra gear for protection in off-road situations. Jeep products look great and can stand up to tough outdoor situations. 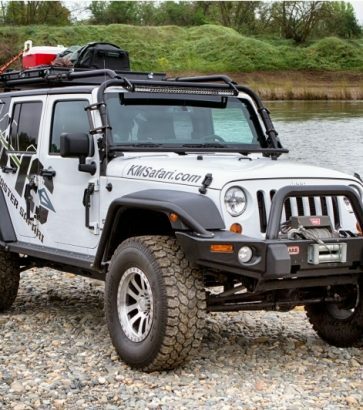 Made of tube steel, these roof racks wrap around the Jeep from the bumpers to the roof. 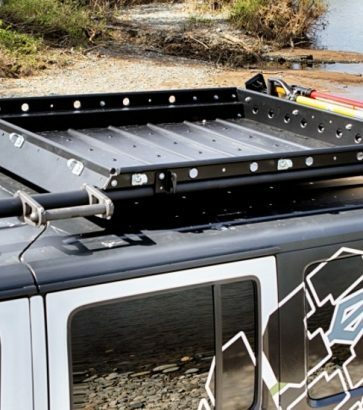 By helping guard the outside of the Jeep, a roof rack can help protect against bumps and dings that can happen off-road. Whether the weather is drier or wetter, get yourself a Jeep rack and experience the difference yourself.